Most people know about the extensive health benefits of juicing, but nobody enjoys the process of setting up the juicer and worst of all, cleaning up afterwards. The healthy juicer is rugged, efficient, and best of all, easy to use and clean! Have you ever tried to juice leafy vegetables such as parsley, spinach or even cabbage in a centrifugal juicer? A good portion of it is wasted and just passes through as these juicers do not have any crushing ability. Vegetables are expensive today, especially organic ones. Why throw your money away by not extracting as much juice and nutrients as possible from them? The specially designed auger easily accepts pieces of fruits and vegetables and has tremendous crushing power. The Healthyjuicer is more efficient at juicing wheatgrass. Below is an actual picture of two samples of wheatgrass after being run through the juicers. The top one is a typical metal hand juicer and the bottom one is from the Healthyjuicer. Notice how the bottom sample from the Healthyjuicer is like a piece of rope. Completely dry with every bit of juice extracted. The unique plunger tool for pushing vegetables into the widemouthed opening of the juicer also doubles as a handy lever to assist in attaching and removing the suction base. Another wrench is included to help tighten or loosen the end cap cover. 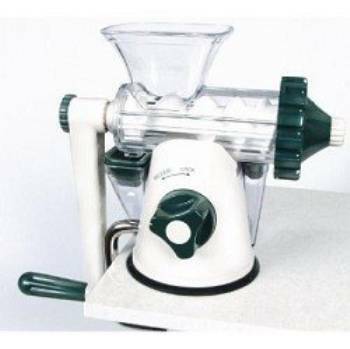 The Healthy juicer does the same job as other expensive electric crushing type juicers for a fraction of the cost. The Healthyjuicer is compact and light enough to take with you when you travel. The patented suction base is rated at over 100lbs of force. It securely attaches to any smooth kitchen counter or table. And because the healthy juicer requires no electricity, you do not have to worry about attaching electric cords or having motors or switches breaking. With the healthy juicer you will want to juice more because it is easier to use and clean. What good is a juicer if you end up never using it?